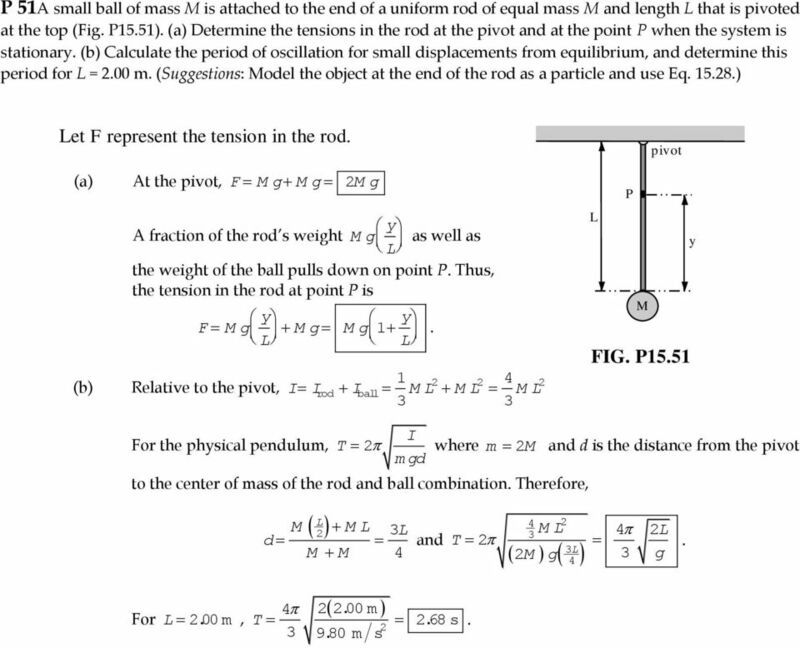 Download "Physics 41 HW Set 1 Chapter 15"
5 4. A very light rigid rod with a length of m extends straight out from one end of a meter stick. The stick is suspended from a pivot at the far end of the rod and is set into oscillation. 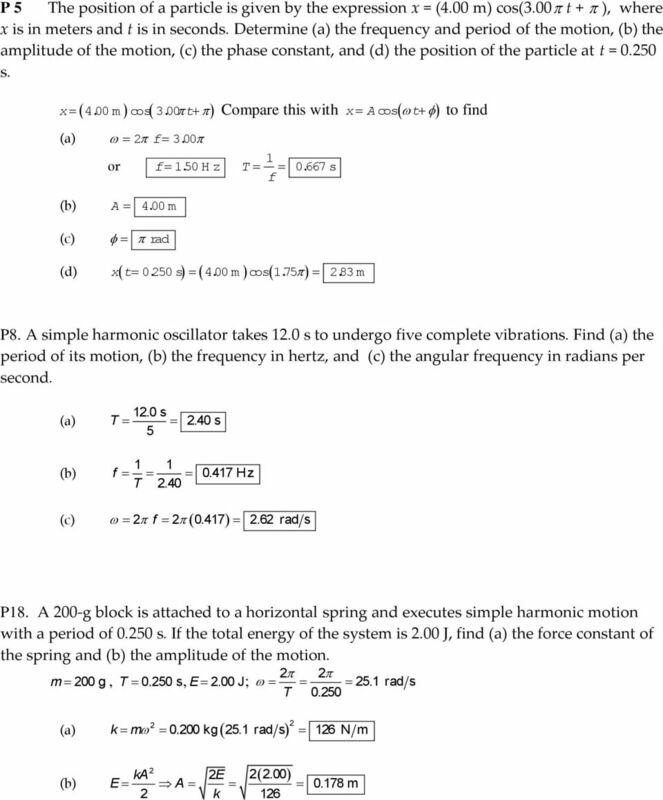 (a) Determine the period of oscillation. Suggestion: Use the parallel-axis theorem from Section 0.5. 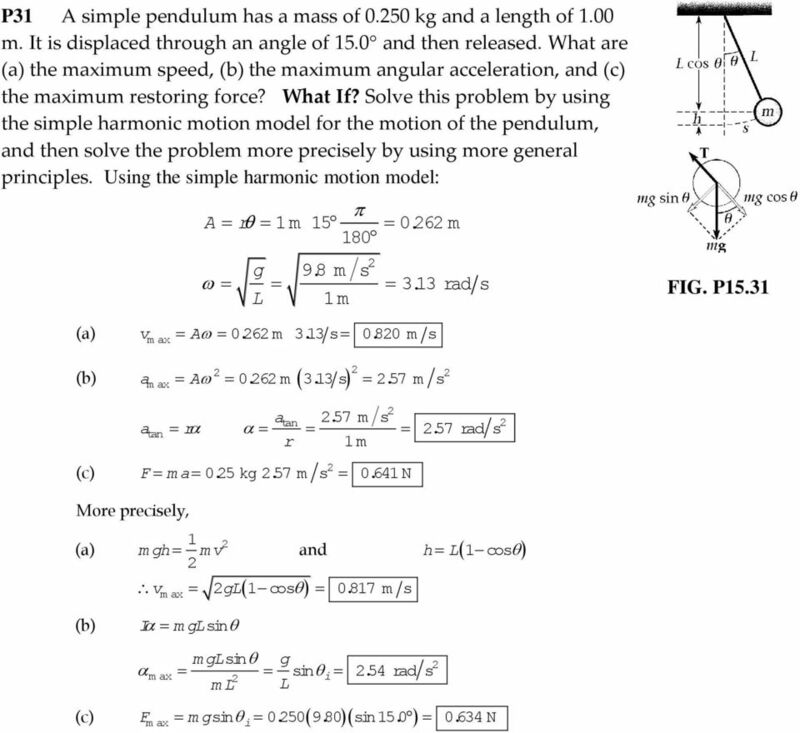 By what percentage does the period differ from the period of a simple pendulum.00 m long? 4. A.00-kg object attached to a spring moves without friction and is driven by an external force F = (.00 N) sin( t). 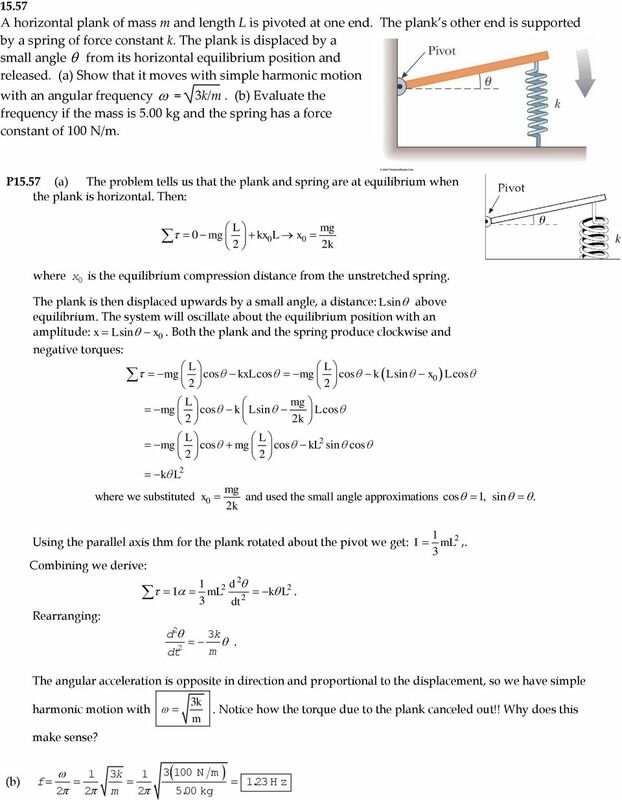 If the force constant of the spring is 0.0 N/m, determine (a) the period and the amplitude of the motion. 6 9. An 0.6-kg object oscillates at the end of a vertical spring which has a spring constant of N/m. The effect of air resistance is represented by the damping coefficient b =.00 N s/m. 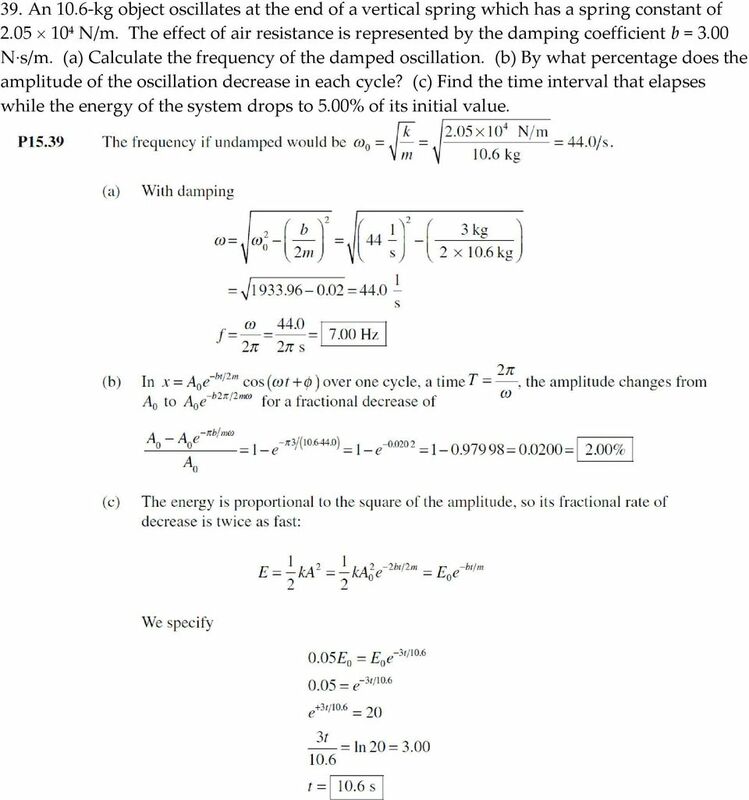 (a) Calculate the frequency of the damped oscillation. By what percentage does the amplitude of the oscillation decrease in each cycle? (c) Find the time interval that elapses while the energy of the system drops to 5.00% of its initial value. 9 Discussion Problems:, 57, 59, 67, 74. 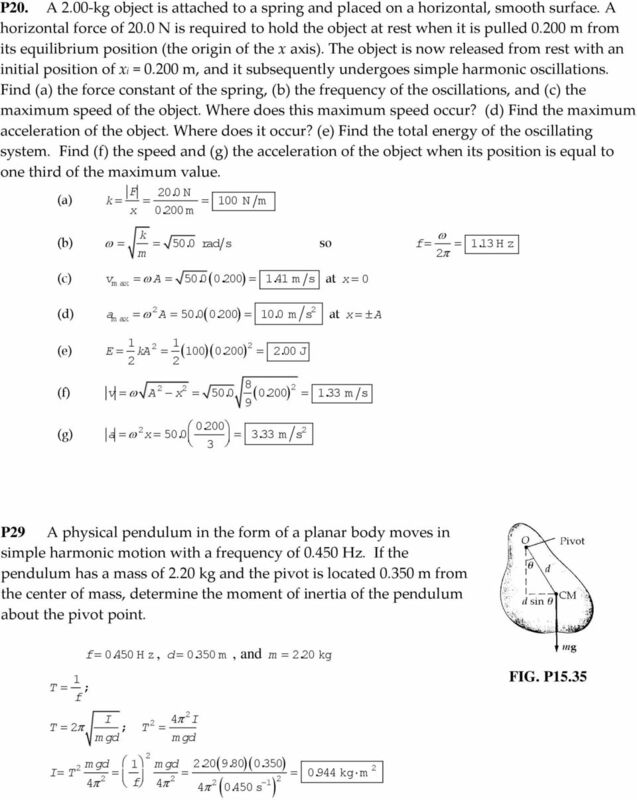 Consider the physical pendulum of Figure 5.8. 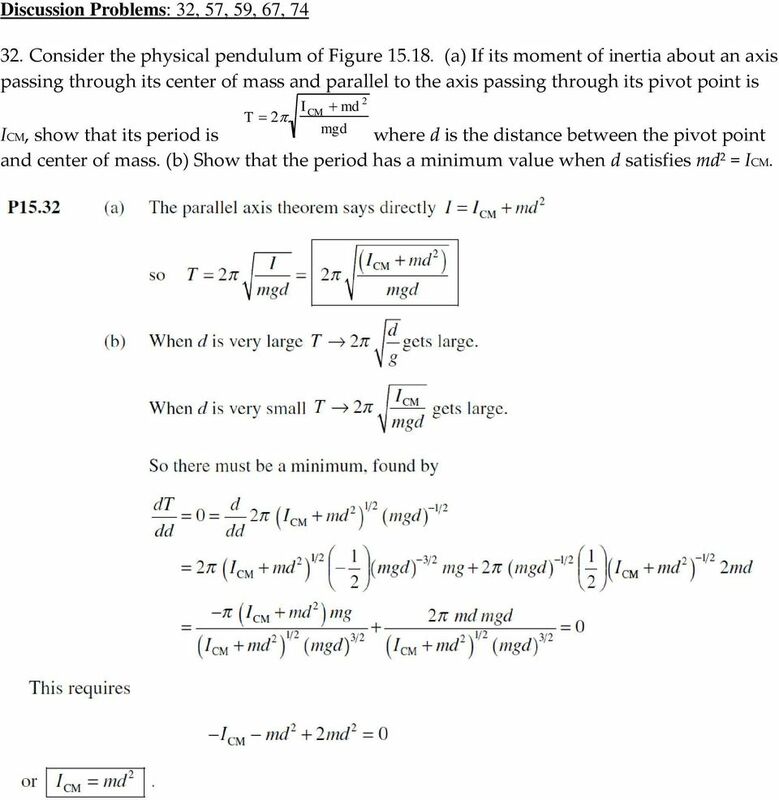 (a) If its moment of inertia about an axis passing through its center of mass and parallel to the axis passing through its pivot point is T I CM md mgd ICM, show that its period is where d is the distance between the pivot point and center of mass. Show that the period has a minimum value when d satisfies md = ICM. 11 59.Review problem. A particle of mass 4.00 kg is attached to a spring with a force constant of 00 N/m. It is oscillating on a horizontal frictionless surface with an amplitude of.00 m. A 6.00-kg object is dropped vertically on top of the 4.00-kg object as it passes through its equilibrium point. The two objects stick together. 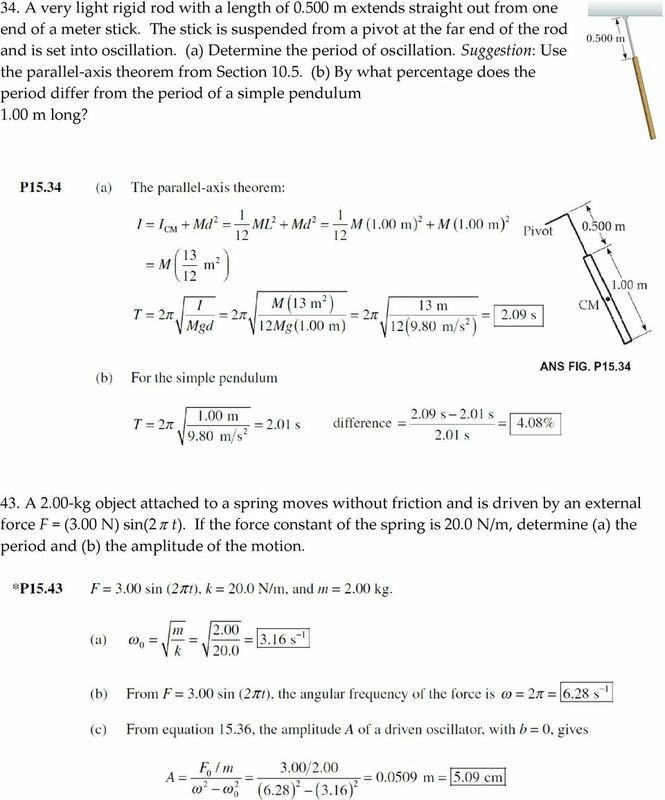 (a) By how much does the amplitude of the vibrating system change as a result of the collision? By how much does the period change? (c) By how much does the energy change? (d) Account for the change in energy. As it passes through equilibrium, the 4-kg object has speed k 00 N m vm ax A A m 0.0 m s. m 4 kg In the completely inelastic collision momentum of the two-object system is conserved. 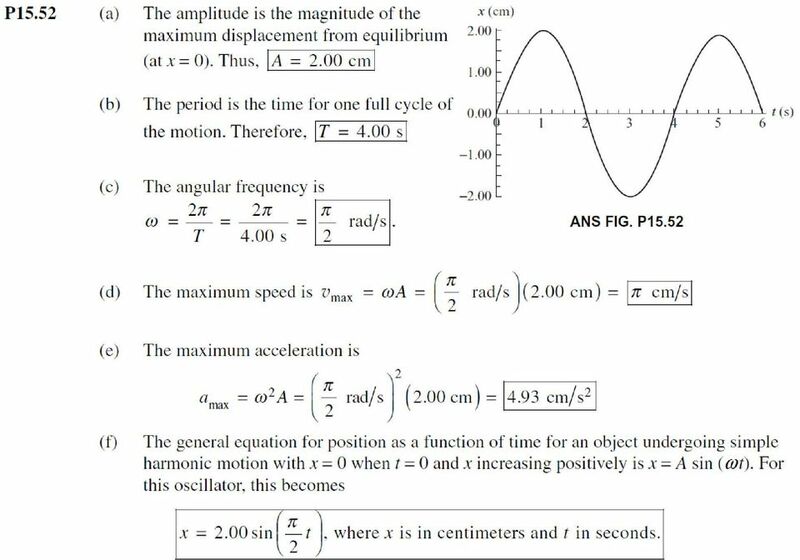 So the new 0-kg object starts its oscillation with speed given by m ax vm ax 4 kg 0 m s 6 kg 0 0 kg v 4.00 m s (a) The new amplitude is given by m v m ax ka 0 kg 4 m s 00 N m A.6 m A Thus the amplitude has decreased by.00 m.6 m 0.75 m The old period was The new period is m 4 kg T.6 s k 00 N m 0 T s.99 s 00 The period has increased by.99 m.6 m 0.70 s mv 4 kg 0 m s 00 J m ax (c) The old energy was 0 kg 4 m s 80 J The new mechanical energy is The energy has decreased by 0 J. 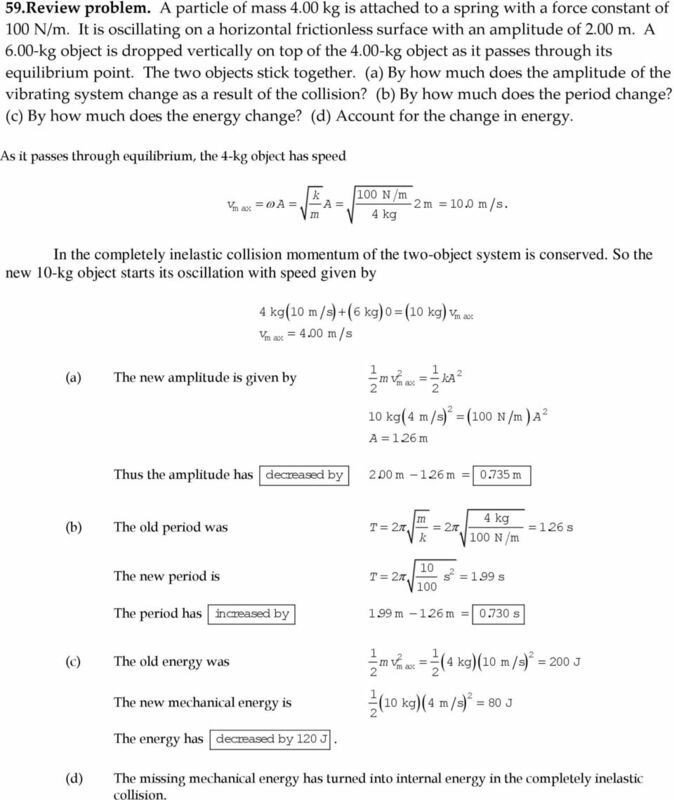 (d) The missing mechanical energy has turned into internal energy in the completely inelastic collision. 13 74. Review problem. Imagine that a hole is drilled through the center of the Earth to the other side. An object of mass m at a distance r from the center of the Earth is pulled toward the center of the Earth only by the mass within the sphere of radius r. (a) Write Newton's law of gravitation for an object at the distance r from the center of the Earth, and show that the force on it is of Hooke's law form, F = kr, where the effective force constant is k = (4/) Gm. Here is the density of the Earth, assumed uniform, and G is the gravitational constant. Show that a sack of mail dropped into the hole will execute simple harmonic motion if it moves without friction. When will it arrive at the other side of the Earth? (a) Newton s law of universal gravitation is Thus, Which is of Hooke s law form with GM m Gm 4 F r r r 4 F Gm r 4 k Gm The sack of mail moves without friction according to 4 Gm rm a 4 a Gr r Since acceleration is a negative constant times excursion from equilibrium, it executes SHM with 4G and period T G The time for a one-way trip through the earth is We have also T 4G e e e Re GM G 4 R 4 g GR R e so 4G g and Re R e 6 T m.5 0 s 4. m in. g 9.8 m s Recall from physics 40 Chapter that the period of an object in orbit around the Earth at the surface is twice this 84 minutes and the orbital velocity is 7.9 km/s. 1.10 Using Figure 1.6, verify that equation (1.10) satisfies the initial velocity condition. t + ") # x (t) = A! n. t + ") # v(0) = A! Notice numbers may change randomly in your assignments and you may have to recalculate solutions for your specific case. M3 AN ROINN OIDEACHAIS AGUS EOLAÍOCHTA LEAVING CERTIFICATE EXAMINATION, 00 APPLIED MATHEMATICS HIGHER LEVEL FRIDAY, JUNE AFTERNOON,.00 to 4.30 Six questions to be answered. All questions carry equal marks. Oscillations 1. 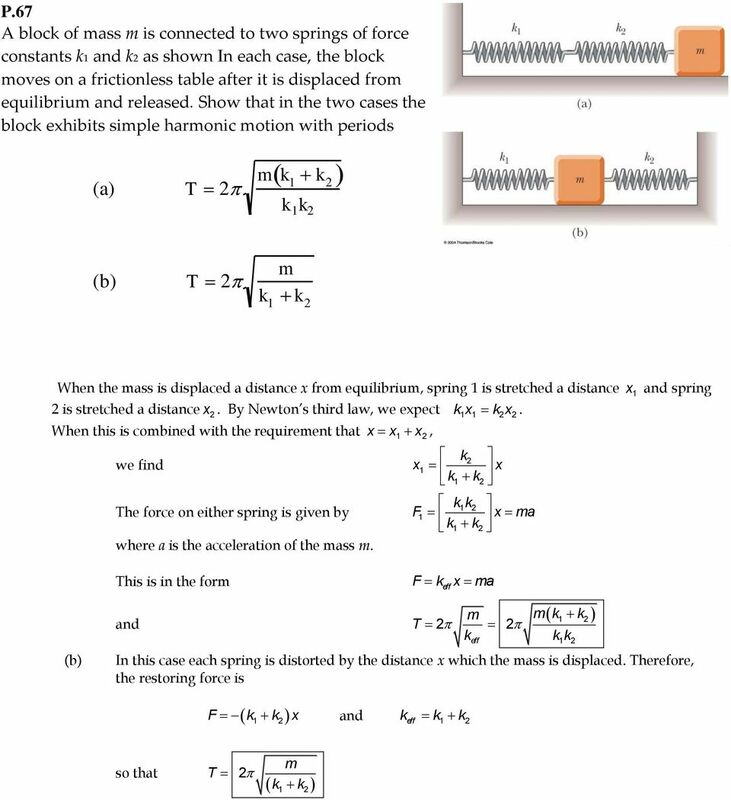 A mass m hanging on a spring with a spring constant k has simple harmonic motion with a period T. If the mass is doubled to 2m, the period of oscillation A) increases by a factor of 2. Physics 53. Oscillations. You've got to be very careful if you don't know where you're going, because you might not get there. A ball, attached to a cord of length 1.20 m, is set in motion so that it is swinging backwards and forwards like a pendulum. A1. An object of mass m is projected vertically from the surface of a planet of radius R p and mass M p with an initial speed v i.